Have you wanted to get involved with Occupy, but not really a marcher? Too far away from an Occupation? Intimidated by crowds? Do you support the right to read and abhor censorship? We’ve got the action for you. The Tucson Unified School District has dismantled its Mexican-American Studies program and removed the books used in that program from the classrooms of the district. Teachers and students have vehemently protested this move, including a student-led walkout and an Ethnic Studies School, arranged on the symbolically important 100th day of school. The day when the state counts heads to determine funding. This is where you come in. Acting in solidarity with OccupyTucson and the students, parents, and teachers of the Tucson Unified School District we are going send copies of the banned texts to Tucson for distribution. Lots of copies. As many copies as we can find and buy. We respect the rights of authors and publishers, so all copies will be completely legally purchased though an independent bookseller or directly from the publisher. Donations of the these texts are, of course, welcomed. We’ll be collecting funds via the WePay link on this page. Any amount will be gladly welcomed and all donations will go toward the purchase of books or shipping books. The repression of the history of resistance, of what Howard Zinn called People’s History, is an old tactic in the class war. Hide what previous generations accomplished, hide the fact of genuine social change in the past, and you hinder the possibility of social progress today. The young people and their teachers in Tucson have spoken loud and clear. They want to know that history and they want those books. Let’s send them some. A few of us will be doing a panel presentation about our library, radical librarianship, the commons, what democracy looks like, what a police state looks like etc. 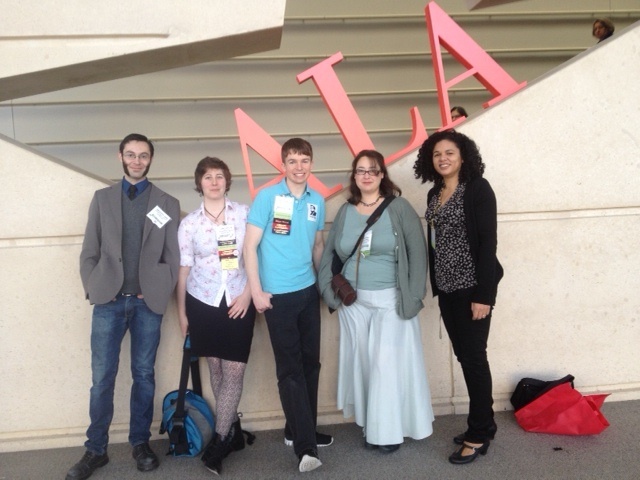 in the ALA Masters Series at the Midwinter Conference in Dallas this weekend. We’ve got a lot to say. We’re very excited to be able to connect with so many librarians about our shared passions & about meeting up with our comrades at Occupy Dallas. 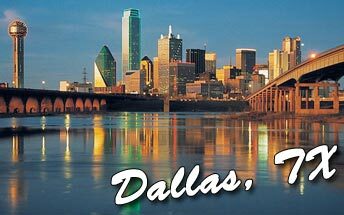 If you’re in the Dallas area this weekend, please join us. This is part 2 of a 2 part series. Part 1 is here. 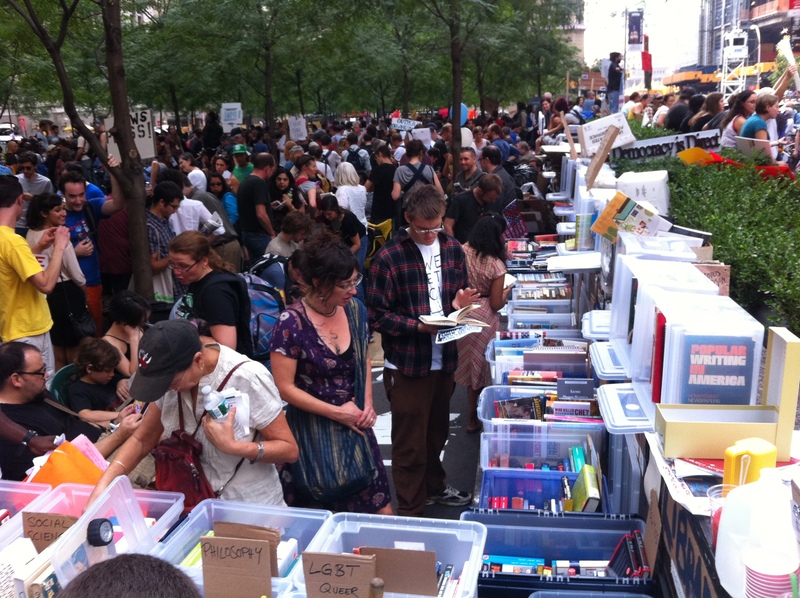 The Occupy movement, and the People’s Library, are, in part, prefigurative movements. That is, they are attempts to create and embody the kind of society we want to see. For many of us, doing business with companies that are so closely tied to the status quo, companies whose structure and management reflect the exact opposite of the world we want to see, is anathema. We can’t change the world, rebuild it into a place of justice and equity, if we can’t reflect the values we support in our internal dynamics and operations. That doesn’t mean that any of us want to see the employees of these corporations suffer or that we want to see the products themselves lost. Rather, we would like to see a new kind of structure supporting the tremendous amount of work involved in creating and maintaining these products. A new structure that, rather than acting as funnel to send wealth to the few, provided material support to those involved in building them, including authors, while still creating the kinds of high quality indexing and access that the information revolution has allowed. While some of us are certainly Luddites, we’re Luddites in the true meaning of the word. The Luddites hated the looms not because they were opposed to making cloth with a machine, but because they hated the economic and social consequences of that transition. It’s worth exploring, briefly, the mechanisms that have allowed these companies to act as wealth concentrators and that have transformed them from genuine partners in the information system into a virtual information cartel run for the benefit of the few. The first way this has happened is through the copyright law. The idea that intellectual fruits deserve special protection under the law is an old one, and a good one. However, like so many of our society’s laws, it has been come corrupted through money. First, authors, especially scholarly authors who often make no money from their publications, are required to sign over their copyrights to the publisher of their work. These contracts almost always serve the needs of the corporation to the detriment of the author. Because scholarly authors require publication to get tenure and continue in their academic positions, they have very little ability to walk away from these contracts and even less to alter them. It’s also worth recognizing that few authors have legal departments working on their behalf to write contracts to ensure their rights are protected. Most are on their own when it comes to wading through these contracts. There has been a strong and growing movement toward open access publishing, but it is being both co-opted and opposed by the corporations themselves. On the other side of the transaction is the library. Libraries have no choice but to do their best to provide access to the materials that their readers need, and often their readers are the very same authors who have provided the material to the publishers in the first place. The publishers know that libraries are in a weak position and have acted repeatedly to raise prices far beyond what can be sustained by library budgets. They have also made the decision to make information available largely through the so-called “big deal.” The big deal offers libraries many different titles bundled together. These “deals” cut into library budgets and make traditional collection development impossible. Instead, it transfers that role to publishers who can add and remove titles at will. The big deal also means that as the price increases, libraries are left with little choice but to cut other places, often the book budget. This model, known as the “access model “, also damages libraries because rather than actually owning a title, libraries are merely renting them. So that when libraries do need to cancel a title or a database, often the entire run is lost. In the old days, when libraries purchased actual physical volumes, a title could be cancelled, but the journals themselves still sat on the shelves, available for use. The access model also creates problems for libraries when applied to ebooks. Ebooks are a great idea and they certainly have a role to play in the information environment, but because of the tremendous power imbalance libraries are at the mercy of publishers when providing these to our patrons. The legal doctrine that protects the primary activity of libraries, lending books and other materials, is called First Sale. Under the First Sale doctrine when an entity purchases an item they are free to use it as they wish. They can lend it, destroy it, or sell it. The item is theirs in a very real sense. Digital information, because of its very nature, has no such protection; instead digital items are controlled by private contracts, contracts that determine what can and cannot be done with the item. That is why ebooks can be deleted after purchase and why publishers can place limits on how many readers a library can allow to borrow an ebook. Since these corporations have both more money and more power than libraries, the contracts strongly favor publishers. The digital environment also poses another serious problem: environmental damage. The materials and energy needed to run the infrastructure pose a significant threat to the natural world. Rare earth mining, disposal of technological waste, and carbon emissions are massive externalities. Companies motivated by profit have no incentive to mitigate these threats and even less so move quickly and decisively to eliminate them. Industrial capitalism, and for a while state socialism, have had two hundred years to reduce environmental damage and have consistently failed to do so. The planet is now dying. The climate is in chaos, the ocean is turning to acid, and we are losing species at an alarming rate. It is time to give another system a chance to do better. Can a high tech industrial civilization exist on this planet without destroying the very systems that make the planet a habitable place for humans? The question is a good one and it one that is not settled. Can industrial capitalism create that civilization? No. It has had a long time to prove otherwise and has failed spectacularly. A better world is possible. Occupy is about creating that better world. A world that is just and fair. A world where everyone has equal access to information and to literature. A world of literacy that is guided by strong and universal moral principles—care for the aged, young and sick, care for the natural environment, care for those who have been marginalized. 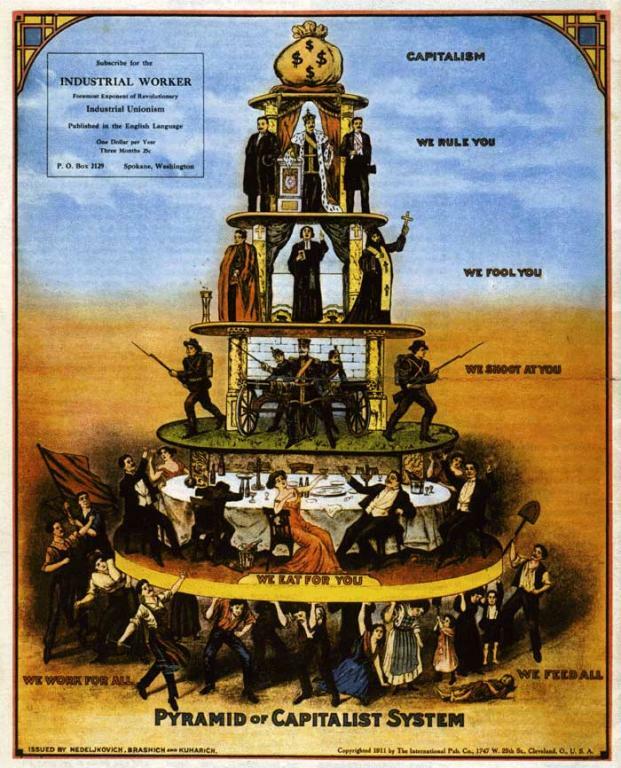 A world that values democracy and nonhierarchical organization. A world that understands that destroying the planet for our own wealth is insane and immoral. We are building new systems in the shell of the old. That new world needs Literature Criticism Online, it needs Business Source Premier, it needs Lexis-Nexis and WestLaw. It also needs a healthy publishing sector. Publishers and libraries are partners and each need the other thrive. But we need a new structure to support these tools and this industry. One that protects the employees, the authors, the library, the reader, and the natural world. One that doesn’t exist to funnel wealth to the few at the cost of the well-being of the many. As a People’s Library librarian one question I get asked over and over again is why we don’t offer a digital library for our readers. It’s a good question and one I think is worth exploring in some detail. To start, we have to address the question of what a digital library is— is it an institutional repository or archive? Is it a search engine for curated links? Or is it a virtual library? It’s an open question and one that I think different people can reasonably answer in radically different, but still valid, ways. A digital library can be and is all of those things. And if by digital library you mean archive, there is one, and probably there are plenty more I don’t know about. 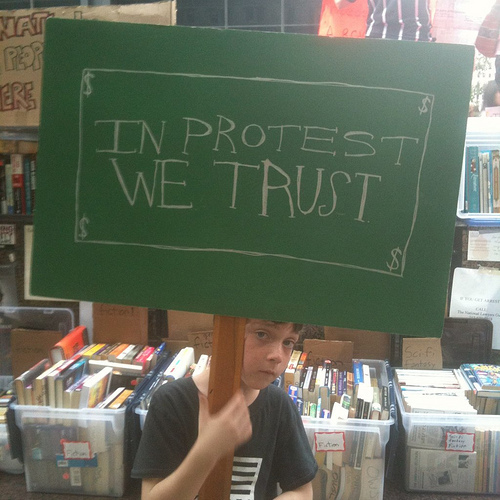 OWS also has its own Archives group working to preserve the ephemera and other documents of the movement. 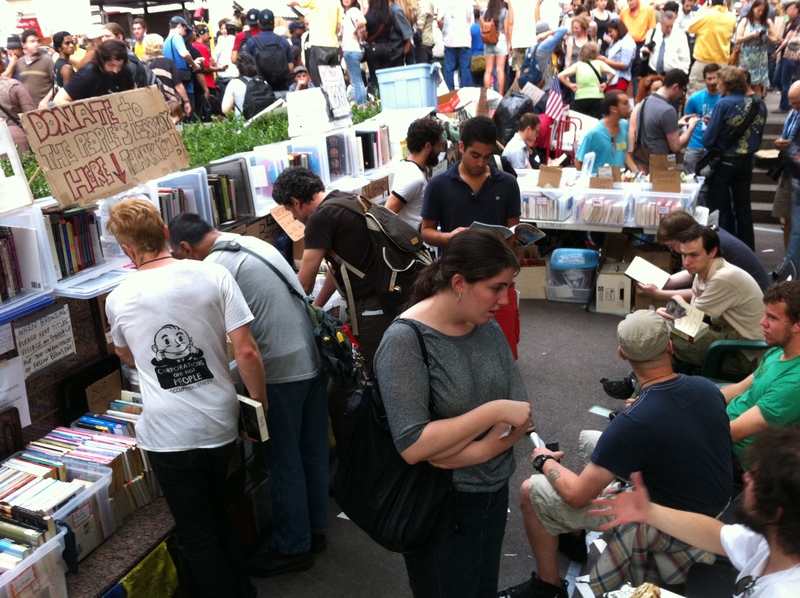 So, in that sense, there is a digital library for Occupy Wall Street. But that doesn’t answer the question about bringing content to our readers. The next question then is what the People’s Library takes as its mission. As a leaderless library, the question of mission is tough to answer; the mission is fluid depending on who is asking and who is answering. 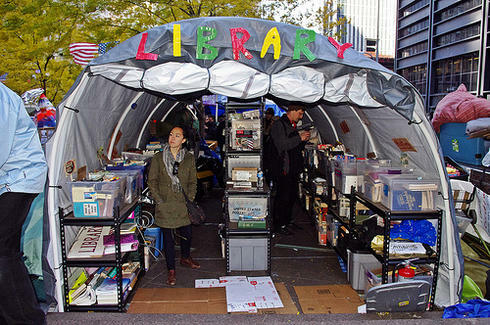 The simplest answer is that the People’s Library and the other occupation libraries exist to support both the full-time activists who live at the various occupations and the Occupy movement as a whole. We also exist to serve the local communities surrounding the occupations, whether in lower Manhattan, LA, or Washington, DC. Given that, a digital library seems a perfectly legitimate undertaking, especially after the raid and seizure of the books. So, why don’t we have one? The first barrier is time. We could offer a list of useful links to our Occupiers and our online community. With an all volunteer staff through, finding time to gather relevant links and then present them with annotations and so on is tough. This kind of digital library also requires quite a bit of maintenance, links need to be added and removed regularly and annotations need updating as content evolves. Searchable or categorized lists of links are also the most basic kind of digital library. They certainly have their place, but what they don’t do is offer content that would otherwise not be available. Instead, they make free content easier to find. A worthy task, but one that takes many many hours of work. Most libraries these days, both public and academic, offer access to databases that contain articles and books not legally available on the open web. This is the virtual library that has evolved as more and more content is born digital and made available not through the codex or traditional journal, but rather through databases like JSTOR, Gale’s InfoTrac, Ebsco’s Academic Search Premier and so on. Those databases and others like them serve two main functions. First, they provide an important infrastructure so that each library doesn’t need to gather and maintain servers, indexers, and so on. This is valuable work, work that few libraries have either the expertise or funds to carry out themselves. It is also work that has a pretty clear counterpart in the print world—remember that dusty old Readers Guide to Periodical Literature or the New York Times Index In many ways, databases are the same thing, just with bits and bytes instead of pages and volumes. The second function is that of gatekeeper. This is a new function for the digital world. Almost everything behind those pay walls you just ran into is copyrighted. That means that the rights to the content are owned by someone and the database companies ensure that those rights are protected. This second function, protecting the rights of the copyright holders, makes providing a virtual library for Occupy pretty much impossible. What database company would (or even could given their contracts with rightsholders) want to offer access to the 99%? These databases aren’t cheap. Like the banks, the publishing industry–the companies who control the databases, has seen consolidation into the hands of a relatively few players. More important than that even, the publishing industry has transformed into one dominated by multinational conglomerates. Projects like JSTOR and Project MUSE are bright exceptions to this rule, ones that deserve our support, but they are exceptions. So, let’s look for a moment at who owns our scholarly heritage and who the People’s Library would need to do business with to provide a virtual library for the 99%. The market for large databases includes relatively few players offering a small number of comparable, but not identical, products. The products fall into two main categories, single publisher databases and aggregated databases. A good public library is able to offer access to both types. ScienceDirect is an example of a single publisher database—you want access to an article published by Elsevier? ScienceDirect is your go-to database. Wiley more your speed? Wiley Online Library is your one stop shopping spot. Interested in a wider range of materials from multiple publishers? Proquest Central, Ebsco’s Academic Search Premier, and Gale’s InfoTrac have got your back. Or would, if you had the cash. Which, unless you’re a 1%er, you don’t. That’s one of the beautiful things about your library card, your local library may allow you access to some of these databases. Or it might not. And who are these companies anyway? If the People’s Library had the funds, is sending them to these folks a good idea? No. Let’s start with the low hanging fruit—Gale. Apax owns a lot of different companies. They also claim a commitment to sustainability and good labor relations. They’ve had a few issues in Israel, are working hard to bring the glories of for profit medical care to India, and they even owned my favorite anthropomorphic train. Pity they haven’t lived up to their commitments—but then who could? With 57 different “investments” across five sectors, Apax isn’t a business or even a corporation, it’s an empire. And like any empire, it has an emperor, one whose salary at 502 times the median wage in Britain certainly befits his position. And like any 1%er these days, Apax owns its share of politicians. Other database companies suffer from the same problem: an extreme concentration of wealth and power into the hands of the few. ProQuest is a bit old fashioned in that its parent company is family owned—a very rich family indeed the Synders are (you can tell by the board memberships, those don’t come cheap). Ebsco, which recently merged with the beloved H. W. Wilson company, is a conglomerate of truly stupendous proportions. Committed to Growth through Acquisitions, Ebsco seems to be run by good people. But they are people who are caught up in a system that has run its course, a system that has generated tremendous wealth for the few through the wonton destruction of the natural environment and human society. People’s Librarian William Scott has an essay in The Nation on the raid and his experiences working in the library. Head on over to The Nation for the full essay.